The club takes over Larne, the Ladies win bronze at the Northern Ireland & Ulster Championships, Gillian claims an age category in Rostrevor and a hardy bunch tackle the Rabbit Run. An amazing 123 athletes from Ballymena Runners - more than any other club - descended upon Larne on Saturday morning for the AES Larne Half Marathon, this year celebrating the 30th anniversary of the host club. The 13.1 mile course incorporated a scenic coastal route starting at Larne Leisure Centre and included the town centre before heading north on the scenic Coast Road. At Ballygally the course took in Cairncastle before returning along the Coast Road heading south to the finish on the promenade. The event was won by City of Derry's Mark Long, while his clubmate and Rio Olympian, Breege Connolly, won the ladies race. Ben Morrow led the Ballymena Runners charge, finishing in an excellent 7th spot overall (1:13:51), ahead of Michael Bennett (31st; 1:19:33) and Noel Connor (47th; 1:21:47) with a further eight runners (Chris Young, Paul Wallace, Jim Moore, Rodney Agnew, Connor Reid, John Hasson, James Turtle and Ian McCracken) finishing inside the top 100, out of the almost 2000-strong field. Judith Brown was first lady from the club to cross the line (1:32:21), followed by Eleanor Forrest Reid (1:41:12) and Vicki Dunn (1:45:00). There were impressive performances throughout the club, and none moreso than Gemma Moore who, competing in her first ever half marathon, took a tumble out on the course and required stitches to a head injury but still recovered to finish strongly. Gemma was just a number of athletes for whom this was their first race at this distance. Others included Parveen Akhtar, Iverene Carleton, Tim Hawksworth, Lisa Kirkwood and Helen Stevenson while Vicki Dunn, Stephanie Johnston, Karen McGaughey and Sinead Scullion were amongst those recording a personal best. Well done to everyone for what was a hugely impressive day for the club. Huge congratulations to the Ballymena Runners Ladies team who won the bronze medal at the Northern Ireland & Ulster 5k Championships at Queen's on Wednesday night. Representing the club to claim third spot were Judith Brown (19:44), Kerry Bamber (18:18), Geraldine Quigley (19:55) and Paula Worthington (19:05). And it was a successful night, too, for Jason Wilson who claimed a new personal best in a time of 16:40 in the 5k while David Hamilton (19:19), James Hamilton (15:33) also produced strong runs. 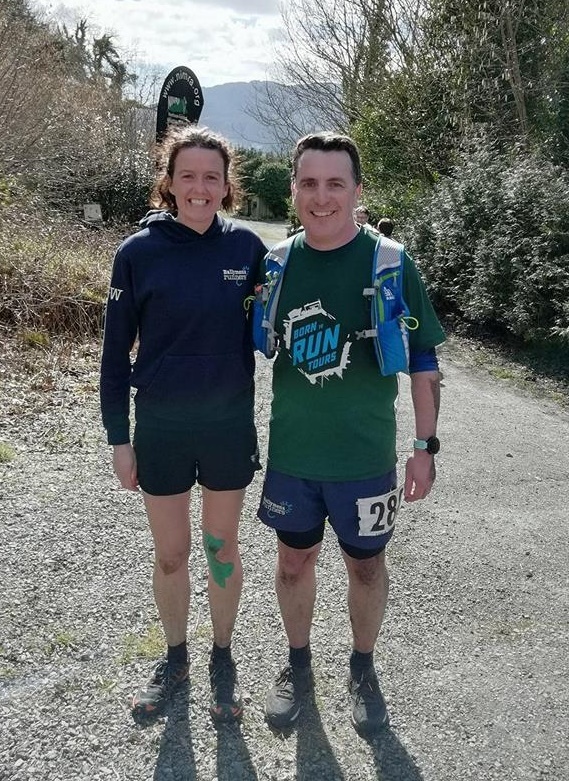 The Northern Ireland Mountain Running Association Championships continued on Saturday in Rostrevor with the Fallows Mountain Race. Two athletes from the club competed in the 10-mile event, namely Jonny Graham (2:01:04) and Gillian Wasson (1:32:31) ... and well done to Gillian on claiming an age category win. As if completing a half marathon 24 hours earlier wasn't enough a brave bunch with, perhaps, delicate legs turned up at Hazelbank in Newtownabbey on Sunday morning to compete in the Rabbit Run 5k in aid of the NI Children's Hospice. Well done Mairead Agnew (34:12), Lindsay Cunningham (46:13), Kate Demspey (34:31), Emma Donnelly (32:59), Karen Hunter (32:58), Lisa Kirkwood (36:06) and Patricia O'Hagan (36:03).